Cross-Eyed and Bucking | Theater | Style Weekly - Richmond, VA local news, arts, and events. "Dirty Rotten Scoundrels" turns scamming into bawdy farce. "Is the floor rotating or are you just happy to see me?" 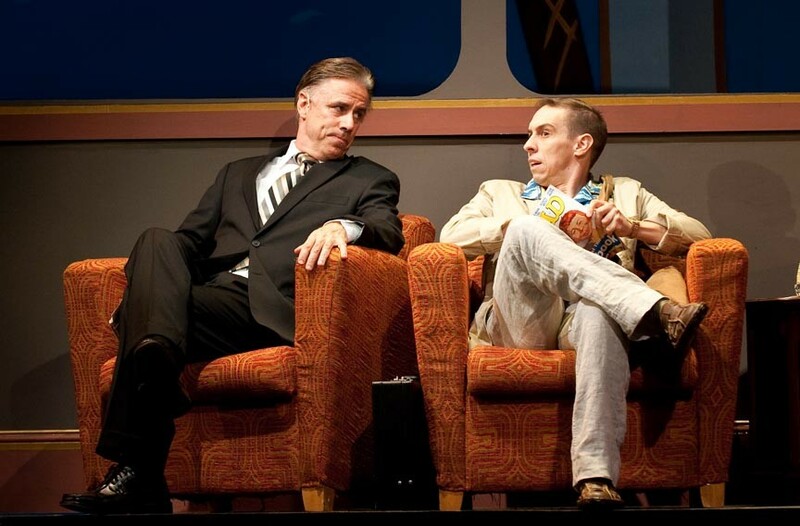 Jeff McCarthy (left) and Scott Wichmann co-star in Barksdale's crude and hilarious stage remake of the 1988 motion picture. Based on the film of the same name starring Steve Martin and Michael Caine, the musical "Dirty Rotten Scoundrels" hit Broadway in 2005, gathering a slew of nominations and provoking a ton of laughs. Barksdale Theatre's staging makes the most of this politically incorrect tale of two con men in the French Rivera, who make a bet to see who can first swindle the same woman out of $50,000. Broadway actor Jeff McCarthy is in full-form as Lawrence Jameson, ladies' man and hoodwinker of the stars. McCarthy's rich voice and acting chops are on display as the debonair con man. Matching McCarthy every step of the way is local favorite Scott Wichmann as Freddy Benson, the lower-tier but still conniving scammer who Jameson takes under his wing. Rachel Abrams plays the patsy, Christine Colgate, bringing her lovely voice to numbers such as "Love Is My Legs." Robin Arthur holds her own as Muriel Eubanks, a divorcee looking for romance. Joe Pabst does his best Clouseau impression as Inspector Andre, and Nicole Foret Oberleitner is quite amusing as Jolene Oakes, the Oklahoman with an eye out for marrying Jameson. The cast plays well off each other, never missing a comedic beat. David Yazbek's music features such ditties as "All About Ruprecht," a South Park-esque song about a mentally challenged boy fond of "milkshake enemas" and "genital clamps." Jeffrey Lane's book offers its fair share of jokes with lines like "[ride] me cross-eyed like some glorious bucking French stallion." Director Chase Kniffen has kept up the momentum in this fast-paced production, bringing the same expertise he showed in last year's "Sound of Music." Leslie Owens-Harrington's choreography and Sandy Dacus' musical direction give the show an added spark. With Brian C. Barker's scenic design, Lynne M. Hartman's lighting, Derek Dumais' sound and Sue Griffin's costumes, the show is a technical knockout. The show's rotating floor and multiple moving set pieces take us from bedroom to casino to train car in a matter of seconds, and show off the talent of stage manager Ginnie Willard. Barksdale Theatre's "Dirty Rotten Scoundrels" plays through Aug. 7 at the Empire Theatre, 114 W. Broad St. Tickets cost $19-$46. Visit barksdalerichmond.org or call 282-2620.